Sound Sculpture is back in the Mitten for a showing at one of Detroit's hippest venues for performance and artistic works - the Cube at the Fisher Center at the DSO. Sound Sculpture opens the show with an hour or so of interactive play, and the jazz / electronic fusion artist DJ Jon Dixon closes the night. We’re excited to be working with Celebrity Series again this weekend! Come check out the students from Blue Hills Boys & Girls Club, Mattapan Teen Center, and Yawkey Club of Roxbury, followed by some Sound Sculpture action and a special Masary Studioes performance! We’re thrilled to collaborate with Stan Strickland for this Celebrity Series event! Masary Studios will be presenting iterations of Sound Sculpture at PEM's PlayTime After Dark event. Guests will be able to interact with Sound Sculpture and experience vignette's of audio / visual performances that interact with the sculpture and large scale video projections. This multimedia performance poses the questions: How is truth defined, and how do different perceptions of truth converge in public spaces? Live, original music fused with video projections will highlight Old South Meeting House’s unique history as a place to rise, resist, and share one’s personal truth. Responses to questions about truth, action, and change – stories, poems, and phrases sourced from recent visitors on Boston’s Freedom and Black Heritage trails – will be featured in the performance. Visitors can explore the transformed space at 6:30 pm, with the performance from 7:00-7:45 pm. After the performance, talk with Masary Studios artists, National Park Service representatives, museum staff, and other audience members on the competing truths that have built our nation and will shape our future. This performance’s title is inspired by a phrase featured in the Old South Meeting House exhibition Voices of Protest: William Lloyd Garrison’s promise to be “harsh as truth” in the abolitionist newspaper The Liberator. Art on the Trails to Freedom, a collaborative project between New England Foundation for the Arts and the National Park Service, invites artists to create public art installations that explore historical themes and activate select locations on Boston’s Freedom Trail and Black Heritage Trail. This program is made possible with support from the National Parks of Boston "Art on the Trails to Freedom" initiative, the New England Foundation for the Arts, and the Lowell Institute. Sound Sculpture will be activated during World's Fair Nano in Brooklyn, NY. Come have a conversation with the interactive sculpture and light up your day. Sound Sculpture will be making an appearance at the ICA this summer. Come join us! Join us for the much anticipated debut of our interactive compositional public art project, Sound Sculpture. This immersive, flexible interface allows particpants to create music, sculpture and light creations through placement of the blocks in space. Yo-el Cassel's 360 Ensemble of dancers joins us each night for special vignette engagements with Sound Sculpture. Sound Sculpture was made possible with funding by the New England Foundation for the Arts’ Creative City Program, with funding from The Barr Foundation and with additional support from the Boston Foundation. Additional funding provided by The Boston Foundation. Special Thanks to our donors, grantors and our host, The Innovation and Design Building. 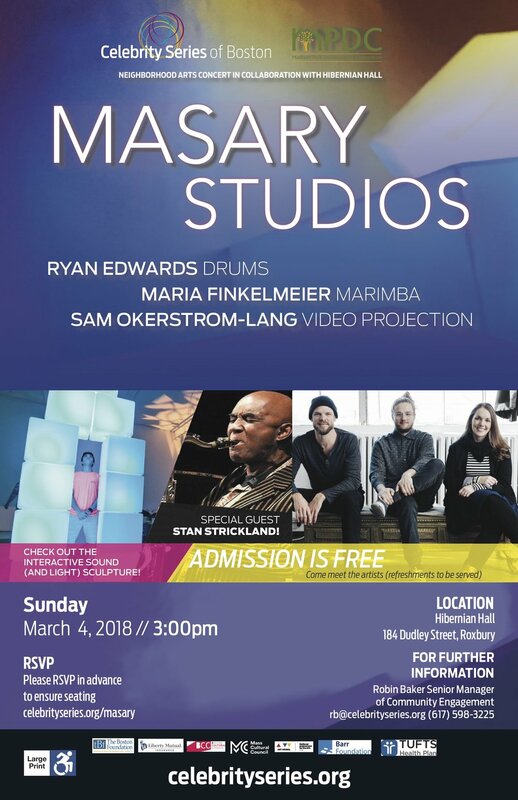 Masary Studios (drum kit, marimba and video projection) will share a unique double bill with choreographer-educator Yo-El Cassell and his theatre movement ensemble, 360* on April 7. Ryan Edwards and Yo-El will work alongside students in a residency at the Boston Community Leadership Academy (BCLA), where students will compose their own “found sounds” rhythm piece to be performed by peers and premiere their original student piece as well. This Neighborhood Arts event will combine forces in a mind-expanding collaboration of music, dance and video projection!